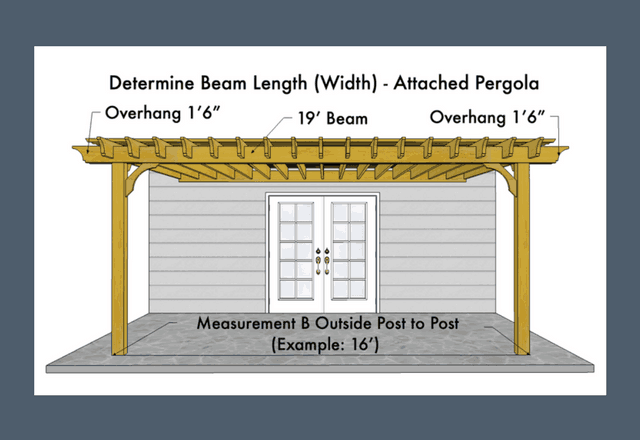 Wondering how to measure for a pergola? Whether you’re interested in a pergola that’s attached to a wall or would like a freestanding pergola, these steps will walk you through taking the measurements needed to help choose the size pergola you’ll need for your outdoor space. Read our comparison of pergola styles while you’re measuring. This will help you decide where to begin. Our pergola sizes are listed as Rafter Length (Projection or Depth) x Beam Length (Width). The thickness of the posts should also be taken into consideration when planning for the space in between the posts or in between the wall and posts. The Big Kahuna, The Sombrero, and The Fedora pergola kits all have 6″ posts, and The Brim pergola kits have 4″ posts. Each of our standard size pergola kits is designed with an overhang of the Rafters and Beams to the outside of the posts, so that the roof structure is a bit larger than the area inside the posts. This is shown and explained in Step 2 and Step 3. Step 1. Plan Your Space. 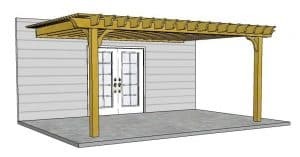 Choose the location and get an idea for the amount of space you would like to use for your pergola. Will your pergola be attached to your house (or other structure) or will it be standing alone on an existing or to-be-built patio? Some customers prefer not to attach the pergola, but install it freestanding immediately next to the house or other structure. How much useable space would you like inside the posts or between the wall and posts, and how much overall roof coverage would you like to achieve? You may need a specific amount of space inside for patio furniture, planter boxes, outdoor kitchen components, a hot tub etc. ; and you may want a specific size roof structure to provide for the most coverage that your space will accommodate. Look at the space you have and consider how much room you would like inside the posts and under roof. 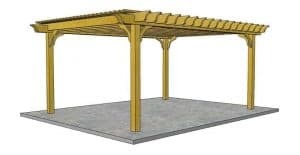 The overall dimensions of our pergolas determine the size of the roof structure. The inside area is always a bit less as explained above. Once you have an idea of the location and amount of space you plan to use, now you can take measurements to determine the actual size kit that you will be ordering. Step 2: Determine Rafter Length. The length of rafters (also referred to as “Depth”), will be calculated by measuring the distance you would like to have from the wall to the outside of the posts (for attached), plus the overhang. Using a tape measure, pull your first measurement from the wall (where the pergola will be attached) to the spot where you would like the outside edge of your posts to land. This is Measurement A. Then, add the overhang to that measurement. The attached Big Kahuna has a 1’6″overhang past the outside edge of the post. 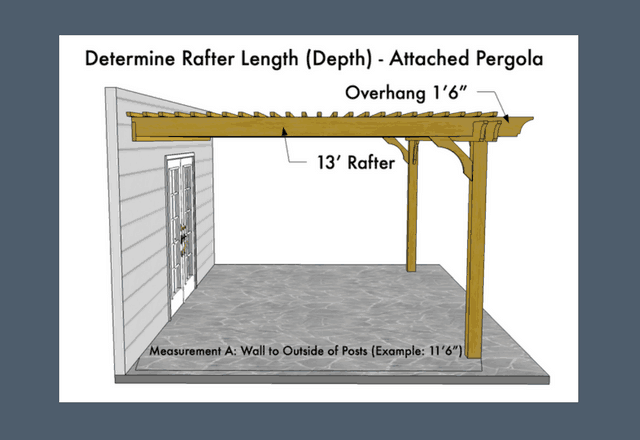 To calculate your Rafter Length for an attached pergola, it is Measurement A + 1’6″. Take note of this measurement, as this will be the first number in the size pergola you choose. (In our example showing a 13’x19′ Big Kahuna attached pergola, this calculation would be: 11’6″+ 1’6″= 13′ = Rafter Length of 13 feet). For a freestanding pergola, the difference is that the Rafter is not attached to a wall, so there is overhang on both sides. The length of rafters (also referred to as “Depth”), will be calculated by measuring the distance you would like to have between the outside of the posts, plus the overhang. Using a tape measure, pull your first measurement from the spot where you would like the outside edge of one set of posts, to the spot where you would like the outside edge of the other set of posts to land. This is Measurement A. Then, add the overhang to that measurement. The freestanding Big Kahuna has a 1’6″ overhang past the outside edge of the post on each side for a total overhang of 3′. 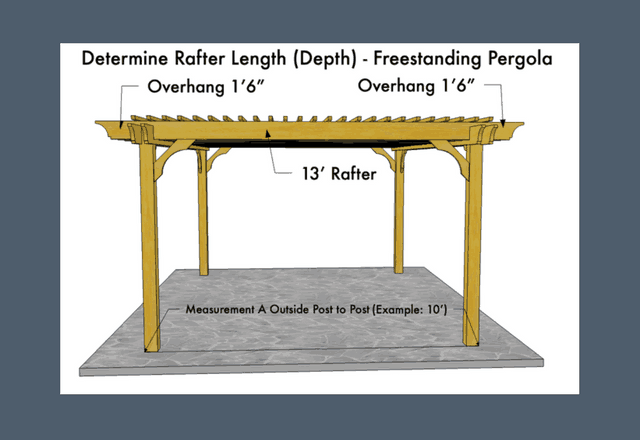 To calculate your Rafter Length for a freestanding pergola, it is Measurement A + 3′. Take note of this measurement, as this will be the first number in the size pergola you choose. (In our example showing a 13’x19′ Big Kahuna freestanding pergola, this calculation would be: 10′ + 1’6″ + 1’6″ = 13′ = Rafter Length of 13 feet). Step 3: Determine Beam Length. The length of beams (also referred to as “Width”), will be calculated by measuring your desired outside post to post width plus the overhang. Using a tape measure, pull your second measurement between the points where you’d like the outside edges of each post to land. This is Measurement B. Then, add the overhang on each end to that measurement. 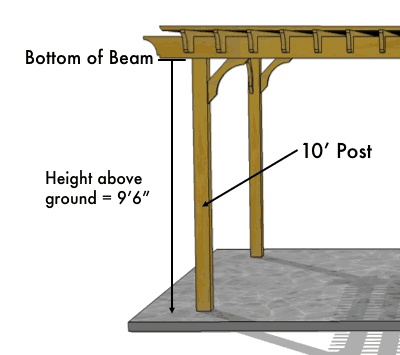 The attached Big Kahuna and the freestanding Big Kahuna have a 1’6″ overhang past the outside edge of the post on each end of the beam for a total of 3′ in overhang, so to calculate your Beam Length, it will be Measurement B + 3′ for either attached or freestanding. Take note of this measurement, as this will be the second number in the size pergola you choose. 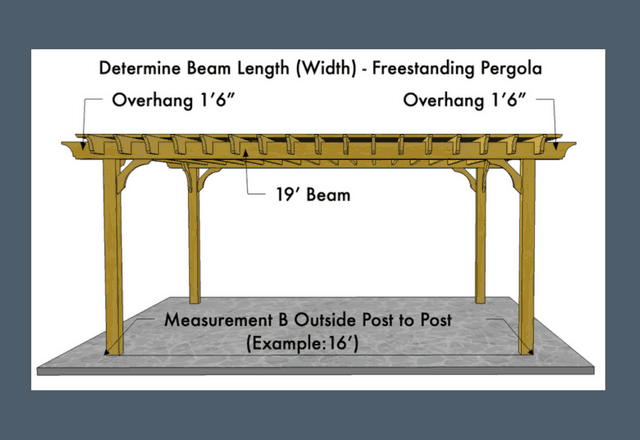 (In our example showing a 13’x19′ Big Kahuna attached pergola and Big Kahuna freestanding pergola, this calculation would be: 16′ + 3′ = 19′ = Beam Length of 19 feet). Step 4: Calculate your Overall (Tip to Tip) Dimensions. This is the Size pergola you’ll choose. Your overall dimensions equate to your Rafter Length (that’s the answer you got at the end of Step 2) x your Beam Length (that’s the answer you got at the end of Step 3). This will be the Size you choose as it’s listed on our website. Step 5. Determine Post Height. Once you’ve decided on the size pergola you’re ordering, you’ll choose the height of your posts. We offer posts with standard lengths of 8 feet, 10 feet and 12 feet, and can customize post lengths upon request. 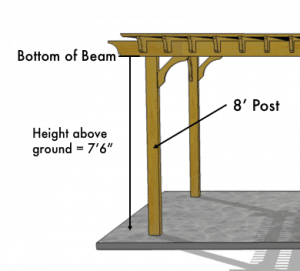 When trying to decide the length of pergola posts needed for your wood pergola kit, there are a few things to consider. Desired height above ground. The height to the bottom of the beam (low point of the roof structure) is: Big Kahuna and Sombrero: 7 inches less than the length of the post that is above ground level, for example it would be 7 feet 5 inches for an 8-foot post (7’6″ if using post mounting hardware) or 9 feet 5 inches for a 10-foot post (9’6″ if using post mounting hardware); Fedora: 14 inches less than the length of the post that is above ground level, for example it would be 8’10” for a 10′ post (8’11” if using post mounting hardware). It’s a matter of choice, but you probably don’t want to make the pergola too tall. For the Big Kahuna and Sombrero, 8 or 10-foot posts suit most situations unless you’re installing your posts more than 2′ in the ground. For the Fedora, we recommend 10′ posts on a slab or footer and 12′ posts (or longer) if going in the ground. Smaller kits generally look better with a shorter post. But, keep in mind things like ceiling fans or other accessories, head room for tall people, standing up in a hot tub or dancing on tables! Read more about post length on our Post Information page. 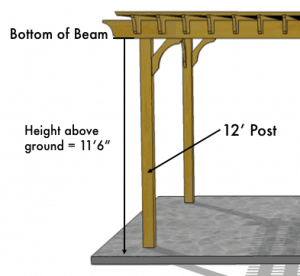 Need Help Finding the Correct Size Pergola? 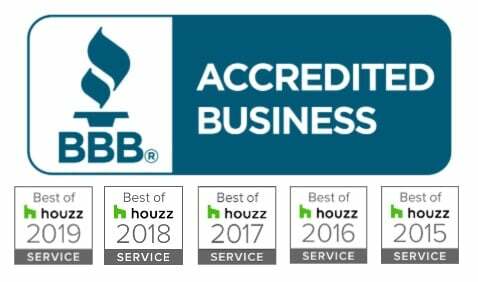 If you need help measuring for your backyard pergola and determining the correct size and style pergola you need, complete our Contact Us Form, send us an email at info@pergoladepot.com, or call us and we’ll get back to you. For outside post dimensions for small pergola kits, medium pergola kits, and large pergola kits, refer to our Pergola Footprint Diagram. We also offer custom sizes. Simply complete a custom quote request and we’ll get back to you!